Powderkeg Cottage is a lovely, self catering Townhouse Cottage in the coastal town of Gosport in Hampshire sat right on the foreshore of the Historic Portsmouth Harbour with panoramic sea views over the harbour and Portsdown Hill beyond. Set over 3 floors this beautifully furnished property enjoys wonderful sea views from its master bedroom, lounge, kitchen diner, 2 balconies and patio garden, The property boasts 3 bedrooms sleeping 5+2 and is located in a peaceful location with off road parking. As the names suggest the cottage was formally part of the Royal Navy's Armories used to store explosives and was recently converted into a beautiful holiday home with Powderkeg Cottage being furnished to a high standard to ensure guests a wonderful stay in this fantastic waterside property. On the ground floor is the front entrance hall with a downstairs cloakroom, separate utility room , stairwell and doorway leading through to the rear open plan, kitchen/living/dining area with a fully equipped kitchen including oven and hob, washing machine, dishwasher, fridge, freezer, microwave etc, dining table, sofa, TV and patio doors leading onto the patio sat right on the waterfront with superb views over the harbour. On the 1st floor is the main living room with large corner sofa bed, flat widescreen freeview TV, music system, DVD player and balcony with uninterrupted harbour views plus bed settee if required. The bedroom to the front on this floor is a pretty room accommodating a 5ft kingsize bed that can split to create 2 single beds overlooking open green space opposite. To the 2nd floor is the master bedroom with choice of a 5ft kingking double bed or 2 singles with a small en suite shower room with shower, wash hand basin and w/c plus balcony with fantastic elevated harbour views. To the front is a third bedroom with single bed and main bathroom with bath, wash hand basin and w/c. Our prices are for up to 5 guests over 3 bedrooms plus we can accommodate 2 more people on bed settees at an additional charge of £25 per week/part week per head or we charge £25 per set of additional bedding requested. All linen and towels are provided and are changed weekly with a mid week maid service available on request. Child cots, highchairs and stairgates also available at no extra cost. (If cots are provided guests are asked to please bring their own child's bedding). If you would like to bring along a pet for your stay this is possible at no additional rental cost but is subject to a £250 pets deposit which is payable 6 weeks prior to arrival. Short Stays are Welcome - Please feel free to enquire. Hampshire is one of Britain's most unspoiled counties, but its coastline is stuffed with seaside resorts and includes the great maritime cities of Portsmouth and Southampton, two of England's largest and most historic ports. Inland lies the New Forest National Park and Winchester was the 9th century capital of King Alfred's Kingdom plus to the east is the glorious chalk-based South Downs. Just off the shoreline can be found the Isle of Wight and opposite is Gosport, a focus for both windsurfers and yachtsmen. Hampshire is also home to the famous National Motor Museum at Beaulieu, a cute bundle of picturesque villages and some of Britain's most enchanting castles and great houses. The more modern city of Southampton lies on the edge of the New Forest and is a bustling container port. It is blessed with a deep natural harbour making it suitable for the largest of ships, including some of the world's luxurious and biggest cruise liners. It was from here that the Titanic set out on its ill-fated maiden voyage in 1912 and before that in the Pilgrim Fathers embarked on their mission to America aboard the Mayflower. Within the ground floor entrance hallway there is a downstairs cloakroom with toilet and wash hand basin. On the second floor the master bedroom has an en-suite shower room with shower, wash hand basin and toilet plus the main bathroom accommodates a bath, wash hand basin and toilet. The living room boasts a large corner sofa bed for additional guests if required, a flatscreen freeview TV, music system, DVD player and balcony with uninterrupted harbour views. Fully fitted with all essential mod cons including oven, hob, dishwasher, fridge/freezer, microwave etc etc, dining table, sofa, TV and patio doors leading onto the patio sat right on the waterfront with superb views over the harbour. 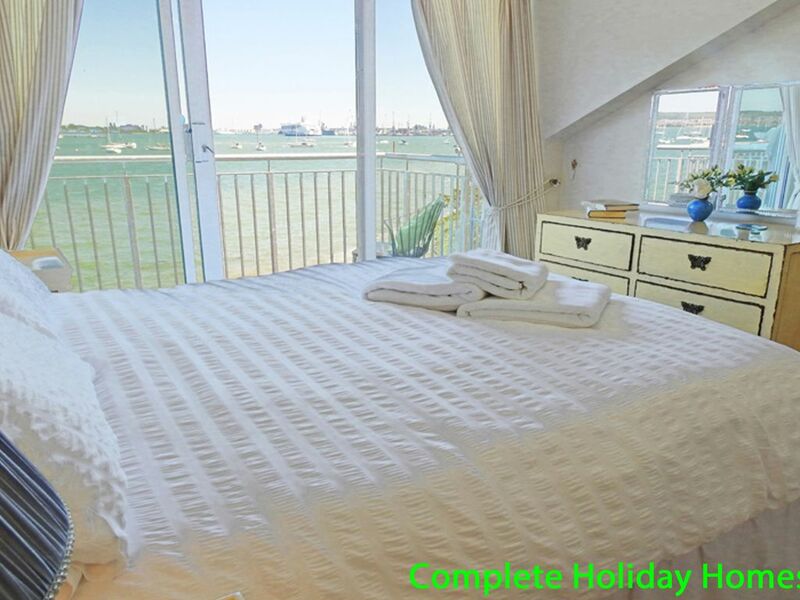 The property is ideally positioned for walks along the foreshore or access into town and the short ferry ride from Gosport lands in Portsmouth Harbour and Gunwharf Quays which is home to the Spinnaker Tower from where you can stand on its splendid viewing platforms and look out over the water to The Isle of Wight and back inland as far as the eye can see. The area is also home to a number of forts, part of 'Palmerstons Follies', the then Prime Minister who commissioned these buildings to deal with or prevent another French invasion which subsequently never happened! These include Fort Brockhurst on land or The Spitbank Fort which sits in the middle of The Solent waters between Portsmouth and the Isle of Wight! Inland within a 5 minute drive we have The Wildgrounds or at Hillhead the Haven Nature Reserve and within a half hour drive The New Forest National Park and then the glorious chalk based South Downs. Alternatively you hop on a ferry for a day trip to The Isle of Wight or France! The separate utility room houses the washing machine, iron, ironing board etc and is situated off the hallway opposite the downstairs cloakroom. All linen & towels are provided and are changed weekly with a mid week maid service available on request. Child cots and high chairs are also available at no cost. (If cots are provided guests are asked to please bring their child’s own bedding). Very friendly reception on arrival.spotlessly clean.Loved the view spent hours just watching the boats.Lots of historical places to visit if you like that sort of thing. Yes I would recommend a stay here. Delightful townhouse with beautiful views of the harbour and Marina from the balcony on first and second floor. Lovely patio area again with beautiful views. Property was well maintained and comfortable. HomeAway personnel are delightful and very helpful. Would recommend the property. A car would be advisable in relation to places to go and see. We were pleased to have you stay and if we could help at any other point in time would be happy to do so. Lovely stay in Gosport. The property is really lovely with big picture windows over the harbour on all 3 levels. Shop 4 mins away and a decent take away. Pub 5 mins walk along the sea front. Nearby Explosion museum - perfect for family visit. Really a much better stay than I was expecting. We have been looking for an accomodation for our trip to Portsmouth and this seemed to be a good compromise. Walking distance to the ferry to Portsmouth but with a nice view and a bit out-of-town. The house at first sight seems to be lovely and the view from the garden is stunning but unfortunately it turned out to be not well maintained. Bed linen with stains, window leaking, pots and pans completely worn out, carpets need to be cleaned, lightbulbs not working, etc. Spoke to the agency and they professed that the property will be refurbished soon what would definitely move this property back up to a 4star rating. If so a lovely house for exploring Portsmouth and its attractions. Wurden sehr freundlich in Empfang genommen. Ein schönes und sehr sauberes Haus! Direkt am Wasser - alles wie auf den Fotos. Gute Ausstattung . Sehr gerne wieder! Situated on the foreshore of Portsmouth Harbour with all its comings and goings or you are a short drive to Stokes Bay, Lee on Solent and Hillhead beaches looking out over to The Isle of Wight where you are likely to find a variety of sailing enthusiasts, windsurfers, kite surfers and jet skiers. With 24 miles of waterfront and fantastic viewing points you don’t have to wander far to find the sea whether you want to go in or on it or just sit and enjoy the view. The nearest airports are Southampton, approximately 32km away, or Bournemouth, around 78km, and Gatwick and Heathrow are the nearest London airports. You can train into Portsmouth Harbour and hop straight on the 4 minute ferry to Gosport where we are situated only a 5 minute taxi ride away from the terminal so a car is certainly not essential. 25% of rental to be paid at point of booking and the remaining 75% to be paid 45 days prior to arrival. Deposit refunded within 7 days subject to no significant damages or excess cleaning. Changeover Day - Flexible - Please contact us for details Notes on prices: Guests over the party size of 5 are charged £25 per head per week/part week which is payable 45 days prior to arrival.